Take two estranged sisters, reunited after 47 years and of course things aren’t going to be comfortable and breezy. Put them in the stately home they grew up in, which is now a dilapidated mansion that one sister has stayed in all this time, and you know someone is hiding something – if not both of them. 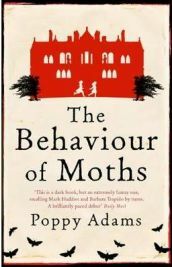 Poppy Adams begins her novel The Behaviour of Moths with older sister Virginia (known as Ginny) nervously waiting for Vivien’s long awaited arrival, and already you can see this visit isn’t going to be a loving and joyful reunion. The cover boasts that this book can be described as Mark Haddon meets Barbara Trapido. Now, knowing Haddon’s most famous book immediately makes one realize that there is someone in this story that has some kind of mental disturbance. Trapido is known for the comic relief in her books. This combination works well to describe this book, except that I didn’t find all that much of this book to be funny. In fact, with the exception of a couple of smiles here and there, I wouldn’t call this book very amusing at all. But that’s not really to this book’s detriment. Certainly from the title you can imagine that this story is going to be unusual. In fact, as we know that moths become animate after sundown, the immediate metaphor comes through. Certainly, the darkness of this novel is what prevails here. Together with that, we can imagine that we will find a creature that is drawn to the light, even if that same light could mean its destruction. Adams’ uses this metaphor to the hilt here, while also including the residual metaphors of how moths can slowly destroy old fabrics, and their frantic erratic movements. For instance, as the book opens we find Ginny both nervous and upset that her baby sister Vivi (as she calls her) is 20 minutes late. As her mind flits from watching for her sister to thoughts of her childhood and her breath on the window, we can already see that this narrator isn’t going to give us a story that unfolds with ease. Vivi too is included in the metaphor. She is the light that Ginny is both drawn to and fears. Throughout the story we see Ginny’s attempts to become closer to Vivi while at the same time almost fearing her. Ginny flits between these two attitudes as quickly as she does between her deep admiration of her father’s work studying moths, and the fraying of the family fabric that this caused. She is meticulous in describing all she learned about moths from her father, but we also find that there are holes in her memories of her family’s relationships. The question here is can Vivi mend what is left, or is it time to say it is beyond all fixing? Adams builds these two characters as carefully as a caterpillar builds its cocoon – strand by strand until the whole shape comes together. This doesn’t make for a fast-paced story, which in this instance, is to its credit. This is because she is also hiding a surprise that has been hidden within, which she layers throughout the book. In this, Adams brings us a mystery that seems to grow, take shape and come to life much like watching this caterpillar’s metamorphosis. And as Ginny notes, you can never tell from looking at the cocoon what kind of moth (a good one or an evil one) will come out of the cocoon until it breaks through. Here again, we see how Adams uses this metaphor regarding the sisters and their feelings regarding what kind of person they perceive the other to be verses what they really are. With all this, one would wonder why I didn’t give The Behaviour of Moths a full five stars. The fact is that the idea and the plot development here are excellently conceived. However, there were a few things that endeared me less to this book. First of all, I found that although Ms Adams did her homework about moths to perfection, that she put a bit too much of this into the book. The passages that describe these creatures and how Ginny and her father slaved away at this hobby were a bit tedious. Mind you, Ginny is a tedious character and that fit, but I could have done with a few less of these passages. This is probably why I found this a bit slow going, as a whole. I believe the plot could easily have been picked up by streamlining some of the narration. I also found that Vivi’s actions didn’t always make sense, and there were many times when I was unsure of why she did things. Finally, I am still unsure how the ending of this book left me feeling. On the one hand, I prefer a book that ends with you needing to think about it. On the other hand, I got the impression that some things left unanswered, really should have been given a conclusion here. As a whole, I cannot say that I wouldn’t recommend The Behaviour of Moths. Certainly the metaphors here are marvelously developed and the main character of Ginny is both vivid and an excellent example of how to use this literary mechanic. Since this is a debut novel, admittedly what has been accomplished here is very promising, despite the drawbacks. Adams’ writing style is crisp and clear, which has been interspersed with just the right amount of imagery to imbue it with a gothic mood that mirrors the home where this story takes place. With all this, I can give this book four out of five stars and I certainly would want to see Adams next work, since this is an excellent beginning. No Comments on "The Behaviour of Moths"